The McCloud River country, south and east of towering Mt. Shasta, was one of the premier potential logging territories of California in the late 19th century. A number of small operators were already in the area, though limited by inadequate transportation, when the McCloud River Lumber Company was incorporated in 1896. The following year, the McCloud River Railroad Company was begun by the same owners. The boom in IPD boxcar leasing was lucrative for a time, but virtually collapsed by 1981. At around the same period, the timber industry all but departed from the McCloud River country, removing the primary freight traffic from the railroad. In 1992, Itel sold the railroad to the Forbis family. They incorporated a new company, the McCloud Railway Company, to conduct operations, and continued through 2008, including the popular Shasta Sunset Dinner Train. But by 2009 traffic had all but vanished, and most of the railroad was scrapped. Included here are more than 385 photographs, many in color and published for the first time, and 41 maps and drawings. The book contains detailed chapters on the history of the different periods of the railroad operation. Traffic data, rosters of locomotives and rolling stock, and financial data are also included. Maps were drawn by John R. Signor using information from the author, with an endsheet map also by Signor. 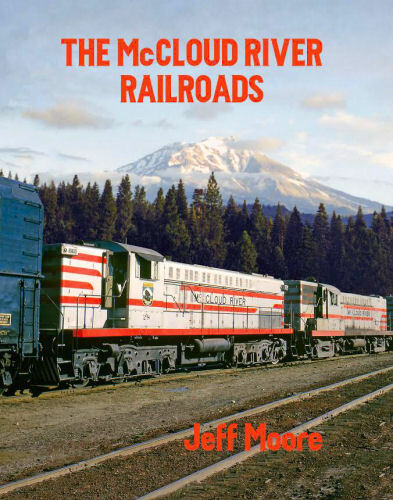 Shortline fans everywhere, and particularly those enthused about logging operatioins, will be enthralled with this book, but the McCloud’s mainline connections mean that many fans of Western railroading will find it interesting and enjoyable too. Hard cover.